This is a zoom lens manufactured by Sigma and the model was launched 2006. The lens has macro-properties but is unable to reproduce things in their real size (otherwise called '1:1'). You should therefor consider taking the term 'macro' with a pinch of salt and if the macro-possibilities you are looking for you should perhaps look at other options. The lens has a focal length of 17-70 mm. Since the lens is designed to be used on a camera with smaller sensor ('APS-C') the focal length will be equivalent to 27-112 mm if you have a Canon camera or 26-105 mm if you have a Niko camera. The lens brightness and aperture value is f/2,8-4,5. One thing to consider is that the lens has a variable brightness, which means that depending on how much you are zooming the lens will have a different maximum aperture value. At 17 mm the lens brightness is f/2,8 and at 70 mm the brightness is f/4,5. Through the link below you can read more about what this could mean for you as a photographer. 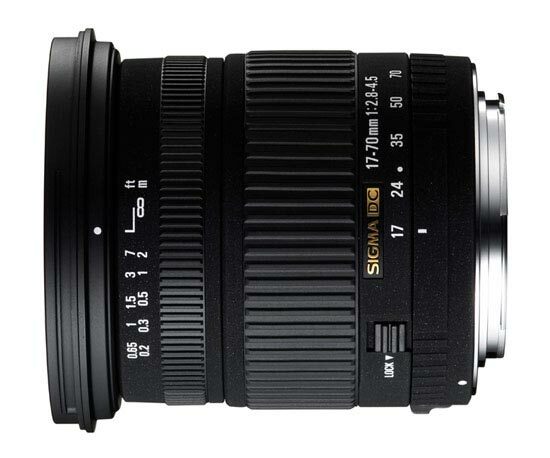 Text from Sigma: "Sigma’s 17-70mm F2.8-4.5 DC Macro is the practical zoom! A large-aperture, standard zoom lens for digital cameras with an open-aperture value of F2.8 (at 17mm) and covers the most frequently used focal lengths. With an aperture fast enough to be used in many light situations, it’s close focusing for use with very small object and its outstanding optical performance make this is an ideal all-around lens for landscapes, portraits, still life studies, group shots and just about any everyday photo situation. With a faster aperture than the typical camera “kit lens” it is an excellent choice for the photographer who has higher expectations for their photo equipment. A lens hood and front/rear lens caps are included with the lens."